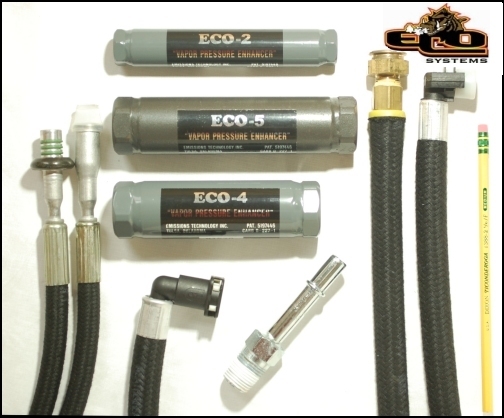 Fuel Lines and Fittings ECO Fuel Enhancer installation kits are assembled with top quality fuel lines and fittings. Fittings are sourced from companies that manufacture them for the parts industry. Special E85 kits are now available. Installation kits are sold separately. The ECO Fuel Systems Fuel Enhancer goes in-line between your fuel line and your engine. Only qualified mechanics, who know how to work on an engines fuel line should install the device. It is an easy installation using one of our kits. Recent install on a Ford Ranger with a 5/16" Quick Disconnect, kit 006. Toyota's, Ford's, 7.3 Powerstrokes. Connection at Fuel Rails, Fuel Filters, or Fuel Pumps. Rover's, Volvo's, Lincoln's. Connection at Fuel Rails. Range Rovers, Volvos, Lincolns. Connection at Fuel Rails. ECO INST-013 For Chevrolet and GM Installations with no quick disconnect. to your engine fuel system, teflon tape, and two tie straps. Use The Tape Fittings must be sealed with the included PTFE Thread Seal Tape. there are many different variations on fuel systems. correct installation kit for your engine(s).